While at the bookstore the other day, we came across a new book and immediately fell in love. The book, Leaf Trouble, by Jonathon Emmett is the story of little Pip Squirrel who wakes one morning to find his home (a tree) changing. The leaves were changing colors and were falling to the ground. These changes scared Pip and he tried to make things right by catching the falling leaves. Pip enlists the help of his sister, Blossom, and together they try to put the leaves back on the branches. But despite their best efforts, the leaves continue to fall to the ground. It is only when Mama Squirrel sees what her children are doing and explains, “The tree has to lose its leaves.” She told the young squirrels that “looking after the leaves was hard work for the tree and that, after keeping them all summer, it needed a rest for a while…[and] when spring comes, the leaves will all come back again.” This simple explanation seemed to satisfy Pip and Blossom and they played in the fallen leaves until the sun set. 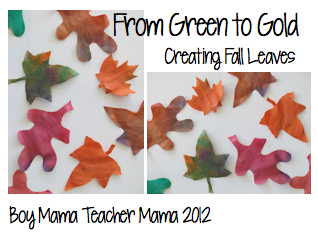 After reading this book, we were inspired to make some of our own fall leaves. So we did and here is how we did it. 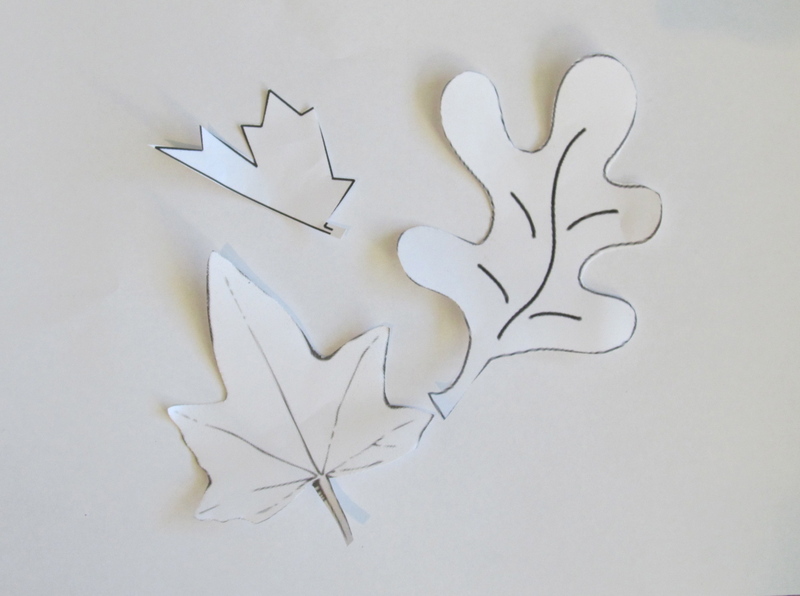 Creating the Leaf Templates: I Googled “leaf templates” and found a few that I liked. I put them into a word processing document, enlarged them to my liking and printed them out. I then glued them to some cardboard from an old cereal box and cut them out. 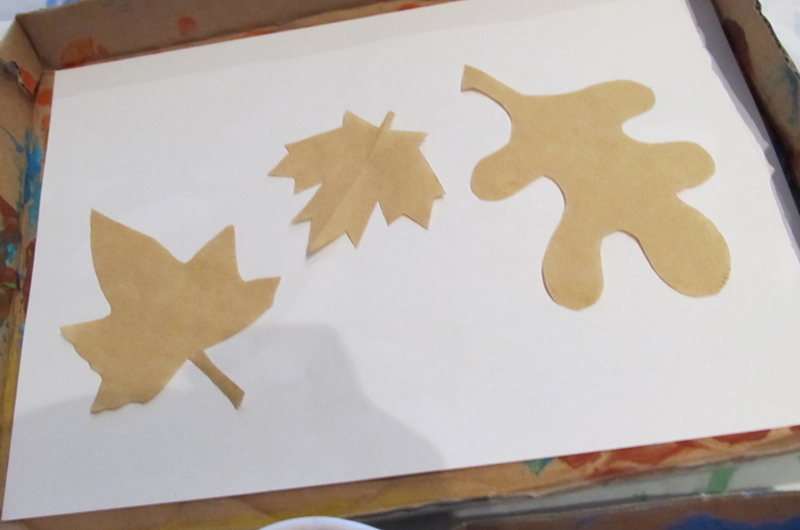 Creating Leaves: I then traced the leaves onto the coffee filters and cut them out. I made several of each type. 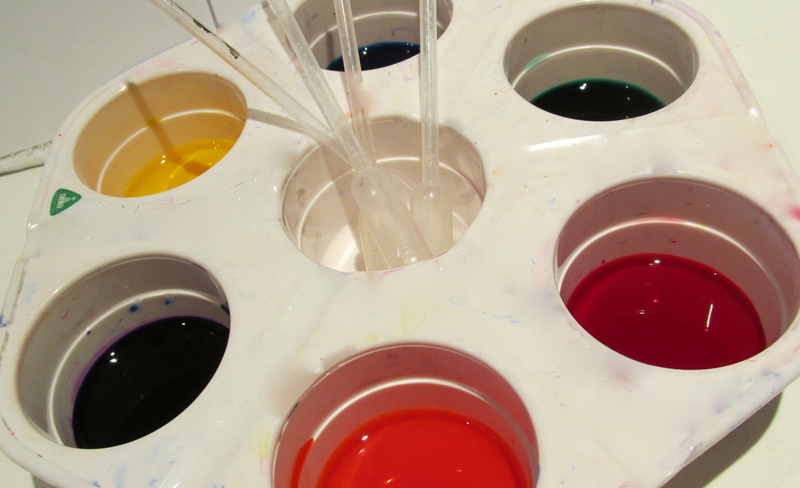 Preparing the Paints: I used our liquid watercolors which I purchased from a teacher supply store. Regular watercolors or even food coloring will work as well. 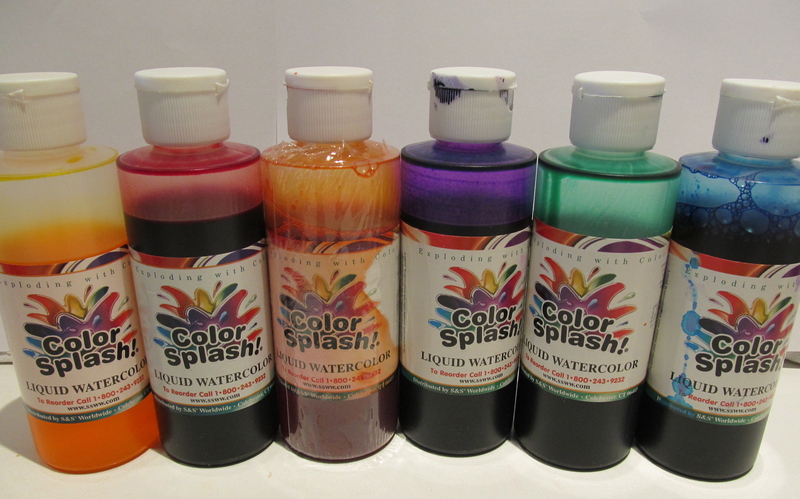 I mixed about 1/2 tsp of each color with about 1/4 cup of water. Setting up: When my boys paint, we have to sit on the kitchen floor in our rented apartment or else they would destroy the carpeting. I also have them put their paper (or whatever they are painting) inside a box-top lid or the cardboard trays our dog food comes in. This way, nothing gets ruined and it actually provides a personal workspace for each of them. I gave each of them a box with a plain piece of white paper and 3 leaves to start with. 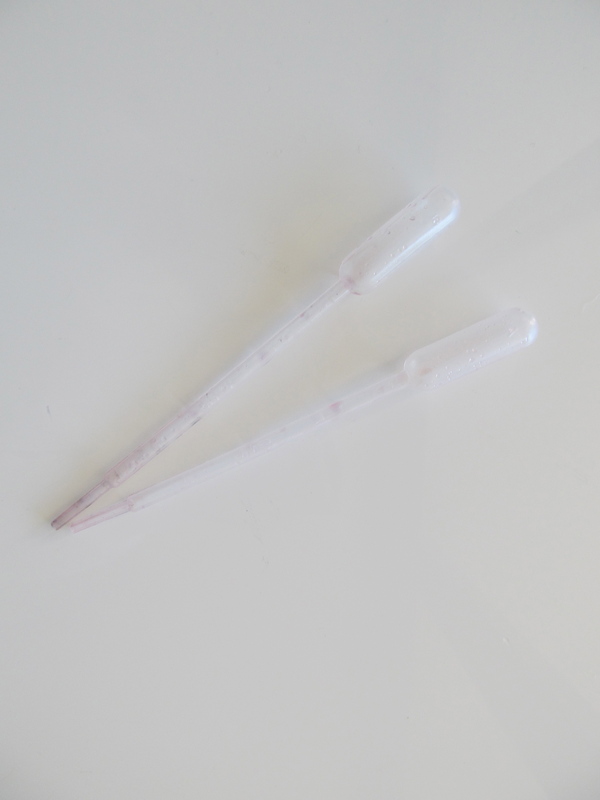 Directions: My older son has used the liquid water colors and plastic droppers many times both at home and at preschool, so he needed no instruction. My younger son, had never used either of them before. So, I took a few minutes to show him how to squeeze the top, insert it into the watercolors, let go and then move it to the paper where he could squeeze to his heart’s content. 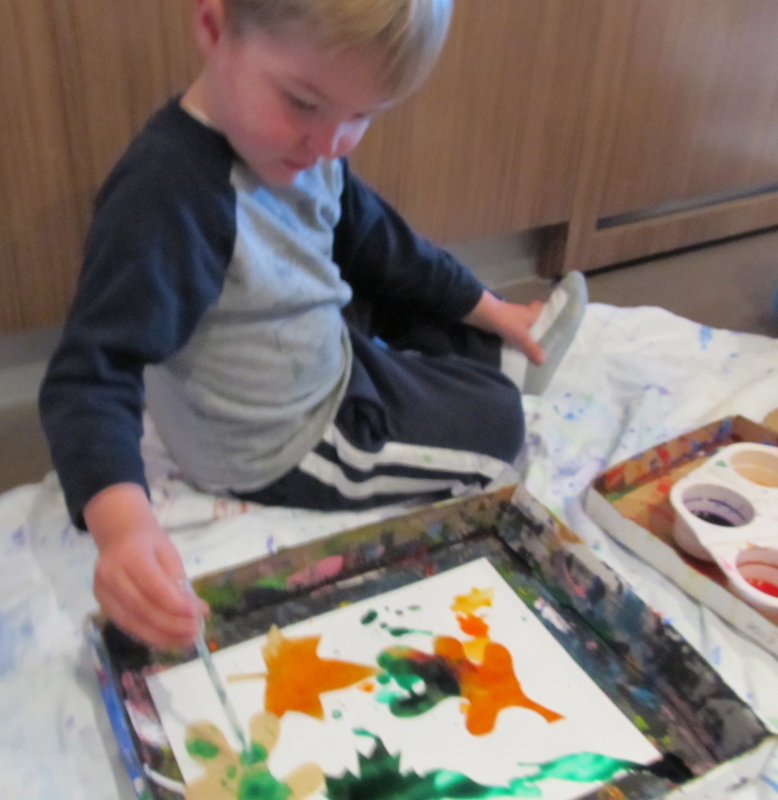 It took some practice and there was quite a bit of paint splatters, but he eventually got a hang of it. Painting: Then they were off! They used the droppers to put the watercolors on the coffee filter leaves. They experimented with small drops and big puddles, used all the different colors and even tried out dipping the leaves into the paint instead of using the droppers. 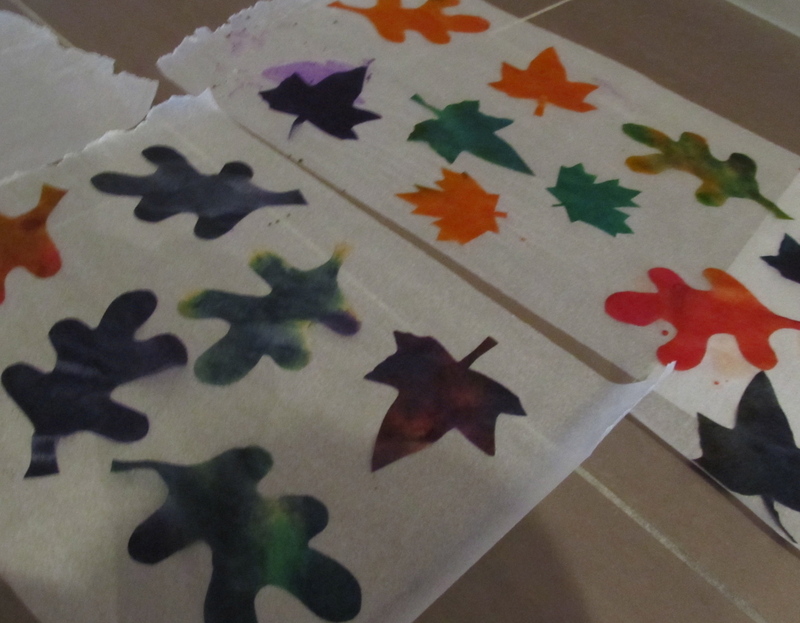 After painting the leaves, we left them to dry on wax paper. They dried fairly quickly and the colors remained vibrant. When we lifted the dried leaves from the wax paper we were left with this beautiful sight! 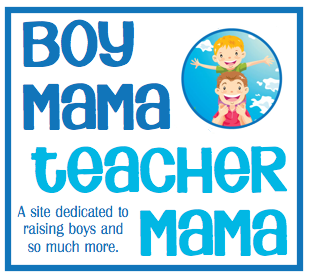 This is going on the window in my son’s room! The results: The boys created beautiful leaves! The colors were just as vibrant as the leaves in our story and the leaves outside. Use straws to blow the leaves. See how long you can keep them off the ground. Create a tree from cardboard boxes/tubes or paper and hang the green leaves on the tree and place the other leaves below the tree. Hide the leaves and have a leaf hunt. 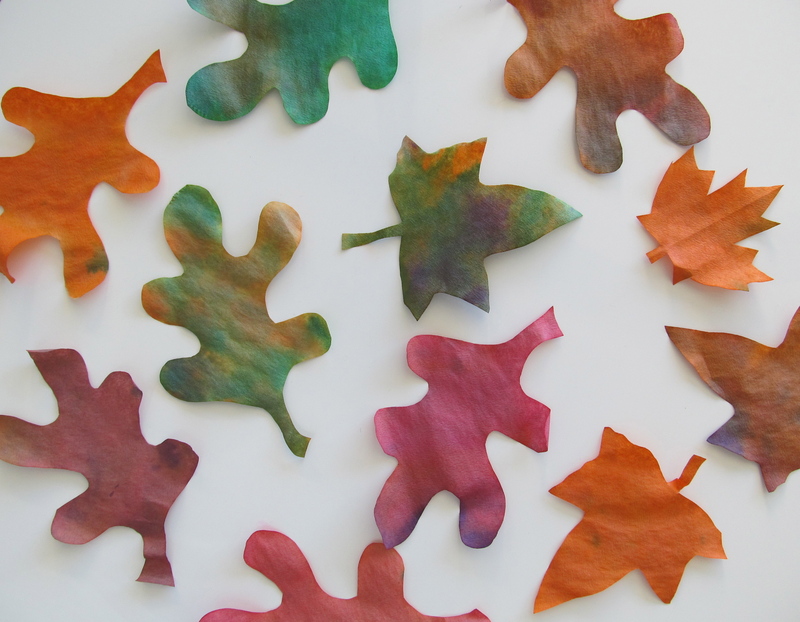 Sort the leaves by shape or color. 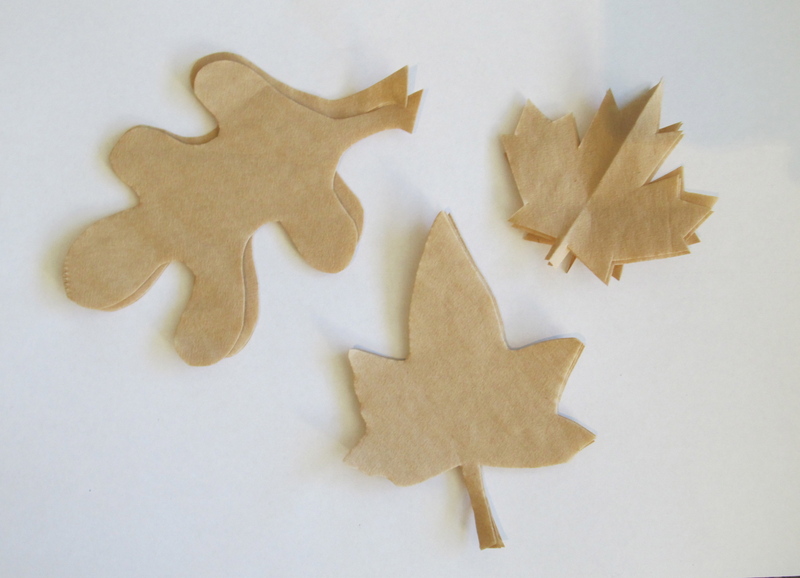 Write a message like,”Just Dropping in to Say Hello” on the leaves and give them to friends and family. Stick some in the mail for faraway family. Oh I love this, I somehow missed it when I was looki for Autumn ideas to feature on the sunday showcase. I might have to sneak it in, it’s such a great idea. That would be great! For some reason your message ended up in spam. Hmm. The results are beautiful! This looks like a great project (and book) for my girls. They love fall–the colors, the leaves, the cool weather. They’ll love this. Yay for painting on the floor!! What a fun, pretty idea!! Can’t wait till my kiddo’s a little older… I’d love to try it sometime.